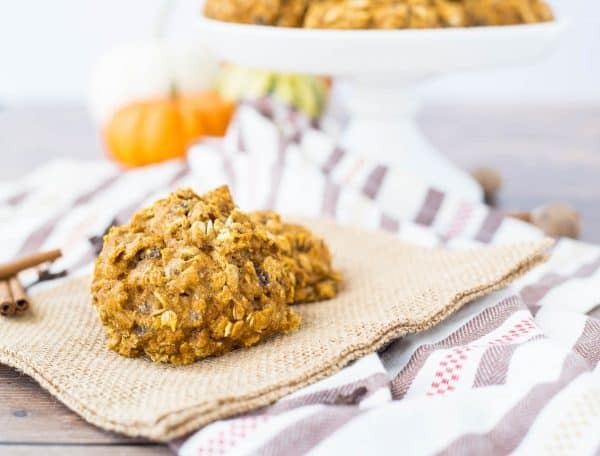 Naturally sweetened and full of protein, these pumpkin breakfast cookies are a powerful (and fall inspired!) way to start the day. I can’t believe how quickly fall is passing us by! It’s already October 10th and the days are rapidly becoming colder and darker. I’m sad to see the warm weather go, but part of me is eager to experience fall and winter in the new house. I’m looking forward to cozy fires, beautiful views of snow, and seeing what wildlife the colder weather brings. I’m not looking forward to bundling the kids up every time we leave the house, but we’ll survive the hassle of that, just like we do every year. Right now I’m still enjoying all things fall, I don’t know why I keep talking about winter! We have plenty of fall left, right? Right? 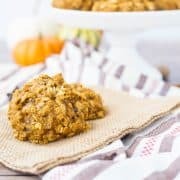 We should be talking about these pumpkin breakfast cookies and apple crisp breakfast cookies and then later we can get to my gingerbread breakfast cookies. These breakfast cookies have a ton of great ingredients in them but you don’t have to go out and buy a lot of ingredients thanks to muesli! As you know, I love Bob’s Red Mill products and I’m thrilled to have them as one of my partners this year. 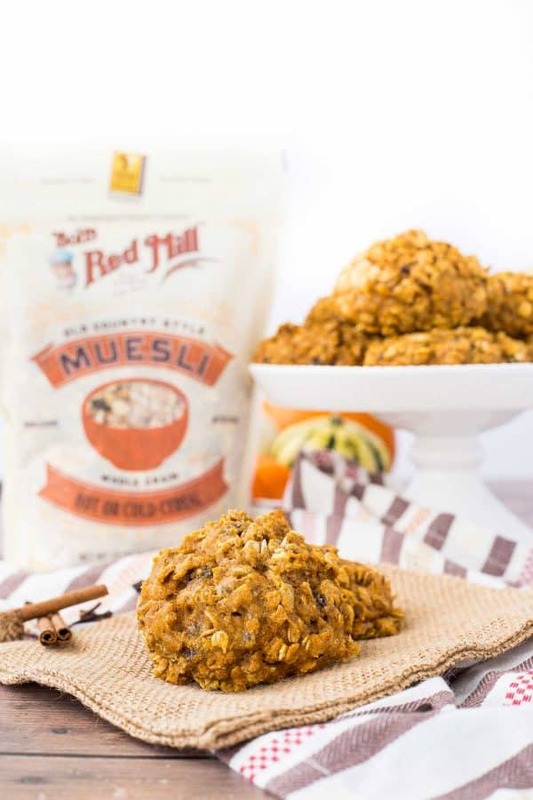 The muesli is available in five different varieties (including paleo and gluten-free) and like many of their other products, now comes in a resealable package, which if you use frequently use Bob’s Red Mill products, you know is a life-changing development. For these breakfast cookies, I used the Old Country Style Muesli. If you’re not familiar with muesli, this variety is a blend of whole grain rolled oats, wheat, rye, triticale, barley flakes, almond slivers, date crumbles, raisins, sunflower seeds and walnuts. No added sugar, and it can be eaten in any way you eat granola, or it can be made into a comforting and filling hot cereal. The muesli adds so many great things to these breakfast cookies, I didn’t have to do much else to make them fabulous. I used pumpkin and of course pumpkin spice (try my homemade pumpkin spice!) and sweetened these only with maple syrup. Ben loved having these for an on-the-go breakfast. PS: Love a little bit of chocolate in the morning? Try my chocolate walnut breakfast cookies. Preheat oven to 350 degrees Fahrenheit. In a large mixing bowl, whisk together pumpkin puree, maple syrup, yogurt, egg, egg white, and vanilla. Whisk until well combined. While whisking, pour in coconut oil slowly. In a mound on top of the wet ingredients, add flour, baking soda, baking powder, pumpkin pie spice, and salt. Mix together dry ingredients gently before mixing into wet ingredients using whisk. Using a rubber spatula, fold in Bob’s Red Mill Muesli until combined. Using a 1/3 cup scoop (or just eyeball it! 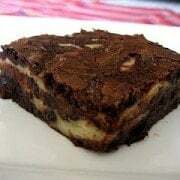 ), scoop dough onto a parchment paper lined baking sheet. They don’t spread a lot so you can put them about an inch apart. Bake for 14-16 minutes or until golden brown and firm to a light touch. Cool completely on baking sheet before storing in an airtight container. If storing for more than a day or two, refrigeration recommended. 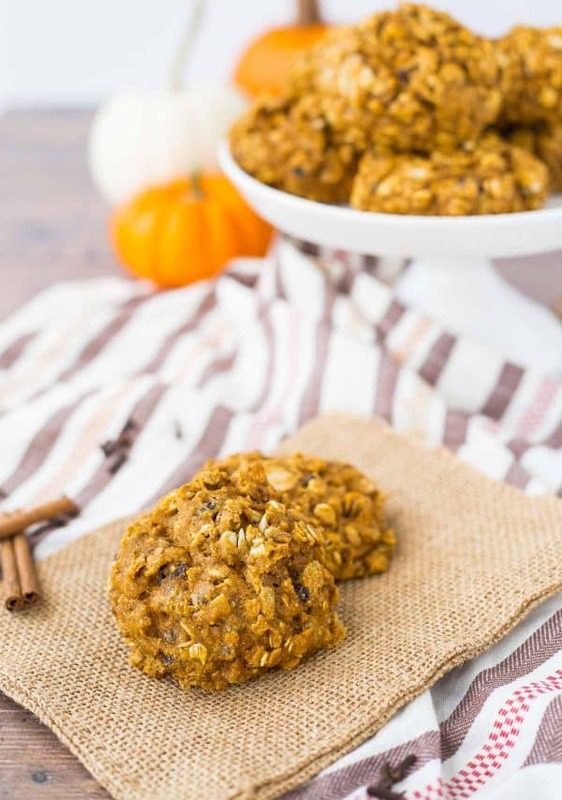 Verdict: I loved these pumpkin breakfast cookies. So flavorful and filling — a breakfast I can feel good about. Husband’s take: Ben loved grabbing these on the way to work, it kept him out of the drive-through line and we’re both happy about that. These look amazing and I can’t wait to try them out for the family at Thanksgiving. Has anyone frozen them? If so, how did that work out? Would love to make them ahead and freeze. Or any other option of doing ahead? Like freezing the batter? Thanks so much for any info! I haven’t frozen these but I’ve frozen other breakfast cookies with success. I would freeze them after you bake them, not the batter. These are great. I loaded them even more to increase nutrition. As a dietitian/nutritionist, I swapped out saturated fat of coconut oil over to the healthier olive oil; decreased syrup in half: and added 1/2 c chopped walnuts. Thanks for a great breakfast treat! Great swaps! Glad you liked them. These look delish. 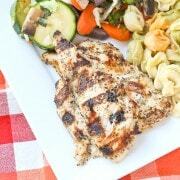 But I am so weary of seeing recipes like this that do not include nutrition information, even a simple calorie count! If you’re a careful consumer — let alone health-conscious — this is important. How many hundreds of calories am I starting the day with, if I make these and maybe have a couple ’cause they’re so “yummy”? Failure to post nutrition info just caters to those easily swayed by pretty pictures. I understand your concern. I do provide nutritional information for some of my recipes but as you can imagine, it varies wildly based on what brand of ingredients people buy, how they prepare the recipe, etc. I am not personally a calorie counter, as I prefer to focus on whole, nutritious foods and everything in moderation. I encourage readers to find an online nutritional calculator they love and take responsibility for their own health – there isn’t much that is more important. As for eating a couple of these, I have no control over that, should people choose to do so. I found that one cookie was plenty enough to keep me full for the morning. FYI, by my calculations, each breakfast cookie has 211 calories — but again, this may vary depending on a number of factors. I love Muesli, especially Bob’s Red Mill. I want these cookies for breakfast! Power packed cookies are truly great for breakfast! I am always ready for cookies for breakfast! BRM’s muesli is my favorite! Love that you put that in this cookie recipe. Thanks Lauren! It was so good! I’m getting more and more excited for a cozy fall too! And cookies for breakfast?? Yes please! I love all things Bob’s Red Mill! I still need to try the muesli. It sounds great, as do these cookies! I adore muesli, especially BRM’s because all the sweetness is natural. 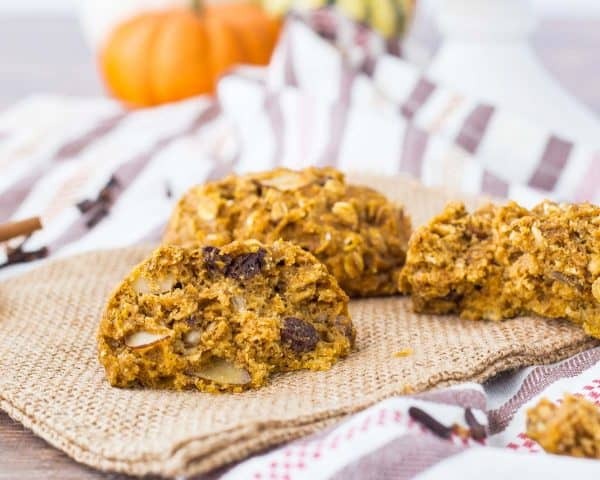 It was genius to make breakfast cookies—between the pumpkin and all the muesli ingredients, they sound terrific! These cookies sound perfect for our trip this weekend! I can’t wait to make a batch! 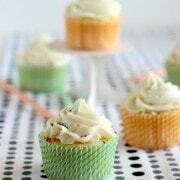 These sound SO yummy, and I want to make them, now! :) I am gluten & dairy free. What would you recommend substituting for the yogurt? Thanks! I haven’t tested it any other way than it is written, so I can’t promise results with substitutions. That being said, I would maybe try either a non-dairy yogurt or unsweetened applesauce.